Oleg Okshewsky was a pilot in the Royal Yugoslav Air Force during WWII. Although he was never trained as a politician, historian, or writer, his lifetime of experience makes him an expert witness to the horrors seen in not only his past, but also in today's world. His predictions about Russia continue to hold true even today. In the United States he taught himself English and worked his way up in the textile industry in New York City. He was very active as a member of the Russian Orthodox Church Abroad and the Association of Russian Cadets Graduated Outside Russia. He also devoted much of his time as a Sunday school elder. He retired in early 1970 and bought a small restaurant, then retired for good in 1980. 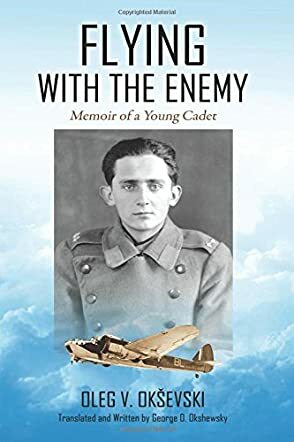 Flying With The Enemy: Memoir of a Young Cadet by Oleg V. Okševski and George O. Okshewsky is an epic of a memoir, the most significant part beginning with Hitler’s attack on Yugoslavia and how the difference between Serbs and Croats played out. In 1942, Oleg, an air force pilot, and his brother decide to fly out and take asylum in an allied nation, the Soviet Union. Unspeakable days await them, shunted from camp to camp, interrogated by different authorities, and housed in prisons of varying degrees of degradation. All their hopes of a release come to naught, only in 1946 does Oleg get released from the status of POW to the Yugoslav Air Force. He later immigrates to the USA and is eventually reunited with Lev. Flying With The Enemy: Memoir of a Young Cadet by Oleg V. Okševski and George O. Okshewsky is to be read to be believed. The treatment they received is succinctly put by Oleg, when they were offered citizenship by the Soviet Union. “You held us, Allied pilots, for no reason. Held us captive without any reason, without any charges brought against us; isolated us for five years behind three rows of barbed wire, behind a tall fence, with machine guns and spotlights aimed at us, etc. More importantly you held us captive with German POWs and you offer us Soviet citizenship under all these circumstances?" This memoir should remind all those in countries like the US. I agree with the author, what good luck they are enjoying, every day and every hour of their life. An excellent read.